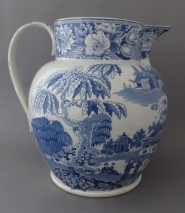 A large earthenware wash jug printed in medium blue with the Malayan Long House pattern. The border on the jug contains a bold and decorative combination of flowers including tulips, and this border pattern is repeated on the inner collar of the jug. An alternative name for the pattern is Malayan Long Hut.